Exercise both sides of the brain at the same time with these complex dot to dots. Intricate, challenging and wildly rewarding to finish. 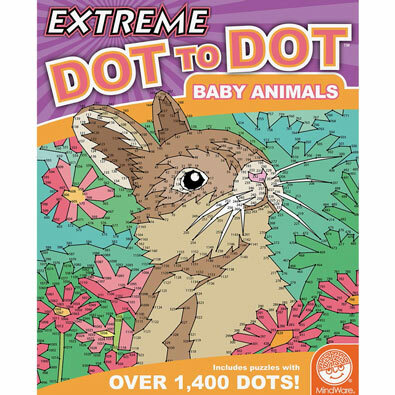 Puzzles range from 500 to over 1,400 dots. Some puzzles even cover two pages! 48 puzzles per book. Ages 8 and up. Exercise both sides of the brain at the same time with these complex dot to dots. Intricate, challenging and wildly rewarding to finish, puzzles range from 500 to over 1,400 dots. Some puzzles even cover two pages! 48 puzzles per book. Ages 8 and up. Exercise both sides of the brain with these complex dot to dots. Intricate and challenging puzzles range from 500 to over 1,400 dots. 48 puzzles per book. Ages 8 and up. Exercise both sides of the brain at the same time with this complex dot to dot. Intricate, challenging and wildly rewarding to finish, puzzles range from 500 to over 1,400 dots. Some puzzles even cover two pages! 48 puzzles per book. Ages 8 and up.